Um, yes – I did have “some” Florida Key Lime Pie this month (a few bites and it was more than enough – so satisfying). We went to Florida to see my step-daughter and her spouse and it was fun. However, coming back home meant we were clobbered with things to do as Christmas moved in…. I am still giving out neighbor Xmas-eve treats (bottom photos). It seems like we are down to 13 plates officially (it has varied over the years from 26 to even 10). Next year I am still going to do this fun sharing – but I think we will be doing bags (not plates) and we will deliver earlier in the day. Perhaps in the morning. And no sugar treats – hmmm – need to get creative so it is still splashes delish their way. Chub is a recipe that has been one of my favorite meals this year. Our version of Chub is ground beef (lightly seasoned), sautéed cabbage, and plain full-fat Greek style Yogurt. Sometimes I add a little cottage cheese too. Other times I add a few pieces of chicken. This is keto-friendly and so satisfying. It can serve as a breakfast, lunch or dinner. Now you might not have noticed, but in the photo of the Chub (above)- in the background are my new salt lamps. Yes, I did get three salt lamps for Christmas – and I am excited to have them. 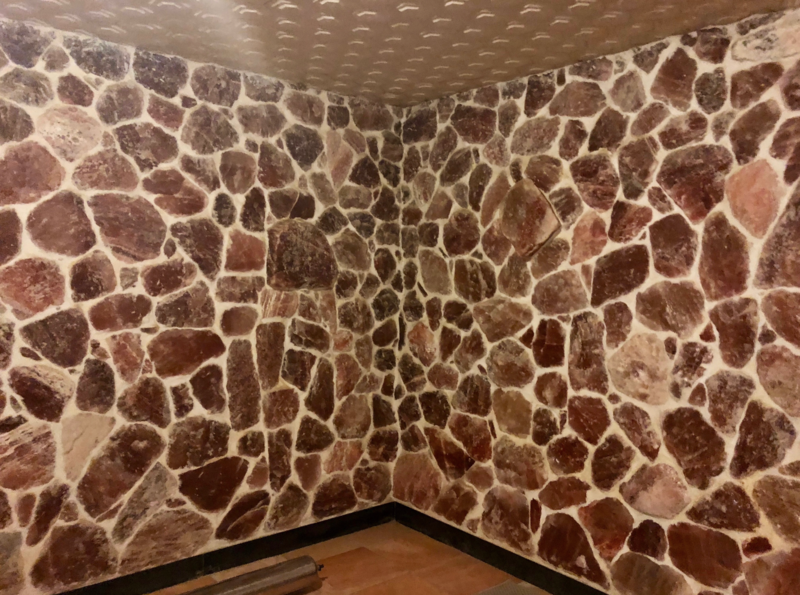 I guess these Himalayan Salt Lamps were more of the rage back in 2015 – so I am a little late to the salt-lamp party here – but now it seems like they are everywhere, including three at the Priorhouse. I am using my salt lamps for air purification; in particular, for reduction of EM in rooms that have a lot of electrical components. However, I also believe that the lamps have a “grounding” effect on the human body. “Grounding refers to the discovery of benefits—including better sleep and reduced pain—from walking barefoot outside or sitting, working, or sleeping indoors connected to conductive systems that transfer the Earth’s electrons from the ground into the body.” More here. And so I feel like these salt lamps offer many small perks to help the quality of indoor air. Dr. Axe has a really good post about salt lamps (HERE) with one of his nice infographics. Another keto-friendly recipe are these fat bombs I made on and off this year. I called them walnut-cups, but Jason said they were fat bombs – and so we went with it. They are super easy to make: To melted coconut oil add, cocoa powder, walnut pieces, and unsweetened coconut – they are sweetened with all-natural Stevia (not the stevia that is corrupted with the food additive Malodextrin – just plain Stevia…) – chill and serve. This next item is also a fav from this year. Even though we have been using NOW Foods brand of protein powder for many years (like their all-natural strawberry and creamy vanilla) as we scale back the sugar and carbs – the unflavored whey isolate is the best. It has no sugars added and it also tastes good. Further, it sticks with you for a while and that matters. I don’t want to get on a tangent about how satisfying keto-friendly meals are – but people do not realize how satisfying it can be to get off sugar (you move away from feeling deprived of sweets to feeling nourished with real foods). December 29, 2017 at ..
All the best for 2018, Yvette. Hi – well I know some folks might slam the salt lamps as a hoax – but the more I learn about grounding it seems that when people “need” bodily help – that is when these things work. but one person even said that the soft glow of the lamp can just calm – whereas others suggest it is the ion and has to do with air quality and to do with particles we cannot see. and if you were closer – I would send you fat bombs in the mail. December 30, 2017 at .. I completely agree that finding little helps can make all the difference, and often just being open for new things or perspectives can be helpful and these lamps sound indeed quite good to me. And I also have friend whom I think would love them too and I’m going to gift her with one to her birthday. hope your fat bombs come out nice…. Those Fat Bombs look pretty good! Great recipes and ideas–thanks for sharing!! Happy New Year! Ah, if only more of us had taken notice of Pooh! I love your generosity, and can’t help wondering if anyone reciprocates? Grace and Peace, dear Yvette. I have a salt lamp too. I am sure you know this, but in hot humid weather they really do sweat if they are not being used. I found out the hard way. It is my indoor sun during the winter. So soothing to look at. oh and a friend of ours, J, had her son tested with a naturopathic doctor and they have him wearing a chunk of the Himalayan Salt as a crystal – or he holds it in his hand – it is supposed to help balance his body – hm – have you ever heard of that? I have never heard of using the salt as a crystal. I do know it is great to throw in the bath. I will have to read up on it. Now I am curious. Rebel Guy goes barefoot all summer for the same reason. He is always at me to do the same. I could not do that – but I am in flip flops (have all types – the cheapies and the higher end ones) and I think I get some grounding that way – and my hubs bought those shoes that are supposed to be like going barefoot – have you seen them – they have toe slots? December 31, 2017 at .. Yes, they are handy and quick to slip on and off in the summer. I won’t walk around in bare feet but once I sit down, I will kick off my shoes and dig my feet into the ground. He swears by it. January 3, 2018 at ..
well good for him – woo -hoo – and cheers to nature and time outside eh? January 9, 2018 at ..
Yvette, I’ve enjoyed browsing through your blog. This article is the one that made me stop and take a closer look because my husband has started us on keto-friendly eating. It’s difficult to do with my 91 year father living with us but sometimes we add things to his meal that we keep off our plates, like pasta. February 6, 2018 at .. I missed this end of 2017 post, Yvette! I like the idea of salt lamps. I haven’t had one given to me, but maybe one day I will purchase one! I like your recipe for Chub. I also liked your treat cups. Mmmmm! will thanks for visiting my blog, Robin. and the salt lamps are under 20 dollars and they even have nightlights. Thanks, my friend! Yvette, it was nice to catch up a bit tonight with you.